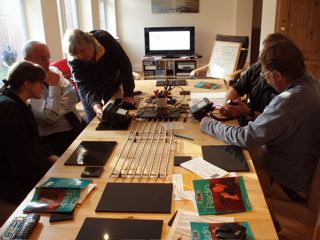 In preparation for the clubs forthcoming expedition to Mull , it was decided to organise a GMDSS VHF radio operators course, so that we could make use of the clubs fixed GMDSS radio’s on the two RIBs.. Whilst many members of the club had already acquired the old VHF licence, few had taken the trouble to up date to the new GMDSS licence, despite the fact that both club ribs have been fitted with Icom GMDSS fixed radios. 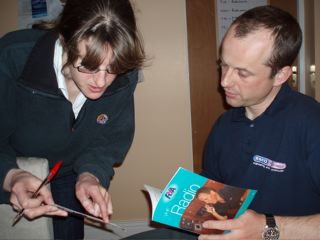 The course was organised to take place at the Hunts home. Cheryl Burton, the RYA instructor from Longscar Powerboating, travelled up from Hartlepool to deliver the training over two evenings after work. The training itself covers a certain amount of theory as well as the opportunity to practice operational voice procedures. The big difference however between the ‘new’ GMDSS course and the old VHF one, is the improved technology that the GMDSS system now offers. Indeed there are several elements that make up the total GMDSS communications package, including Digital Selective Calling (DSC) via radio. The other elements include satellite communications, the use of Navtex for weather and navigation information, Search and Rescue Radar Transponders (SARTs) and Emergency Position Indicating Radio Beacons (EPIRBs). 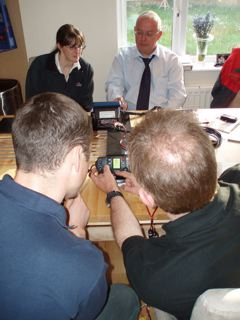 In this regard the GMDSS course is very different from the old VHF course. Using the GMDSS radio however, you can still call up the coastguard and other vessels by channel 16, before opening communication on one of the other designated channels. With the new GMDSS digital technology however, providing you have the relevant MMSSI number of the other vessel you can now in effect ‘dial’ the other caller direct via channel 70. Furthermore, using GMDSS also conveys information direct to the called vessel/station including details of the calling station, and even potentially the position of the caller (if GPS is wired to GMDSS radio system). This information could prove potentially life saving if the distress button on a GMDSS radio has to be activated in the event of an emergency. 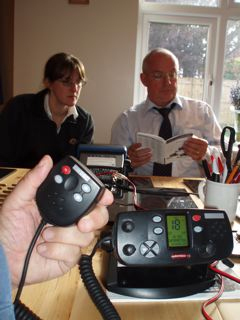 On the course a computer simulator was used to practice calling each other up via the GMDSS system using various MMSSI call signs.  In order to obtain the actual government approved licence qualification, participants must take and pass a written exam as well as be able to demonstrate their competence in using the required voice procedures to the satisfaction of the examiner. Part 1- Certificate of Competence, which is awarded to those individuals who have demonstrated the knowledge required to operate a marine VHF set effectively. Suffice to say on this occasion all participants successfully passed. Many thanks to the Hunts for allowing the course to take place at their house and for providing supper. 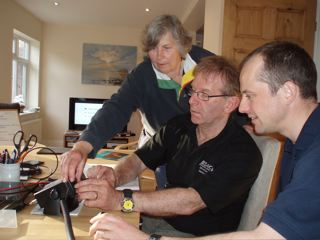 Likewise a big thanks to Cheryl for delivering the RYA training.